We are all familiar with the expression ‘good things come in small packages’ and until now this phrase has never been as accurate as when describing Antigua. Small in size, the island of Antigua is only 14 by 11 miles and boasts a population rivalling that of a town like Daventry (around 80,000 if you were wondering). But unlike Daventry, Antigua occupies a glorious location in the Caribbean Sea set amongst the Leeward Islands that comprise the West Indies. Like with so many of its Caribbean counterparts, Antigua has been sculpted by its volcanic past. Although generally low-lying the island is punctuated by the remnants of an ancient volcano, Mount Obama, rising to 399 metres and standing as a lasting reminder of the island’s volcanic origins. The fertile, volcanically enriched plains provide nutrition for the islands’ lush and verdant rainforests. Antigua is often described as being the quintessential luxury Caribbean holiday destination, and it isn’t hard to imagine why. Together with its sister island, Barbuda, the islands are famed for their lagoons, natural harbours, reefs and of course beaches (and we’re talking hundreds). As well its picture-perfect white sand beaches and sapphire blue seas, Antigua is noted for its rich history and authentic Caribbean tradition. Since its discovery by Europeans in 1493, on what was Christopher Columbus’ second voyage to the Americas, Antigua has had a long association with Great Britain. Beginning with a successful business venture with sugar plantations at Betty’s Hope became a centre for sugar cane production and later emerged as the headquarters for the British Royal Navy Caribbean fleet. Today, the island of Antigua enjoys independence and is a proud member of the British Commonwealth. 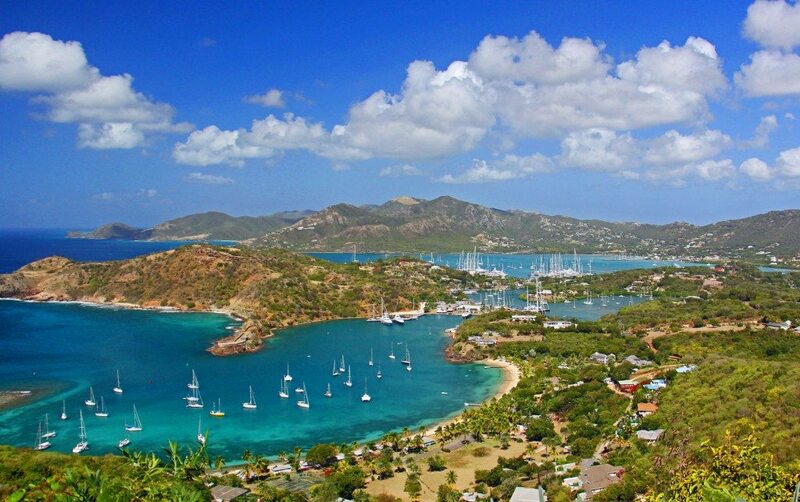 Steeped in colonial history, English Harbour can be found on the extreme south of the island of Antigua. The historic settlement of English Harbour can trace its name back to the great age of sail when the harbour was a safe haven and strategic base for the British Navy, from which naval operations were launched. However one cannot talk about English Harbour without referring to Nelson’s Dockyard. The cultural heritage site and marina is synonymous with English Harbour and is named in homage to perhaps its greatest ever resident, Admiral Horatio Nelson who lived at the dockyard from 1784 to 1787. After falling into a state of disrepair, the docks underwent a renovation in the 1950’s which saw them painstakingly restored to their former glory and original Georgian splendour. The docks which once hummed to the noise of heavy industry, whereas today they hum to the noise of commerce. Former workshops and yards now house sophisticated bars, eateries, shops, art galleries and luxury hotels as well as serving as a marina for the rich and famous in their extravagant boats and yachts. The Dockyard Museum, located in the former Admiral’s House, is definitely worth a visit and brims with exhibitions detailing Horatio Nelson’s stay and the history of the docks. 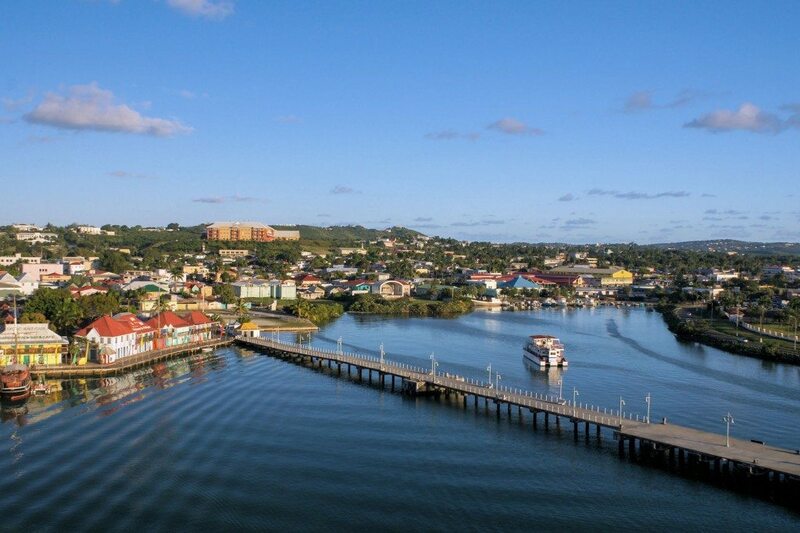 Outside the dockyard, historic fortifications dot the landscape and the Nelson’s Dockyard National Park boasts hiking trails that lead to elevating positions atop of Shirley Heights which bestow visitors with breathtaking Harbour views. St John’s, the capital city of Antigua and Barbuda, is a popular port of call for cruise liners and tourists alike. With tourists come to see the candy-hued rustic cottages, the towering steeples of St John’s Cathedral and the bustling, brightly coloured farmers’ markets. Looking up to the skyline anywhere in the city and you will not fail to notice the imposing white towers of St. John’s Cathedral. Renowned for its grandeur and Baroque architecture, the cathedral is a particularly beautiful building, adorned with carved metallic figures of St John the Baptist and St John the Evangelist – both of which, it is claimed, were seized by the British from one of Napoleons captured war ships. For those with an interest in history, Museum of Antigua and Barbuda is definitely worth a visit. This enlightening museum traces the history of the two islands with exhibits showing archaeological relics, colonial artefacts and recent historical displays. But of course, all you are wanting to know about are the beaches. You could not find beaches anywhere that could better resemble a postcard image of a beach; that fine crescent of pink or white sand dotted with swaying palms, gently lapped by the sea. 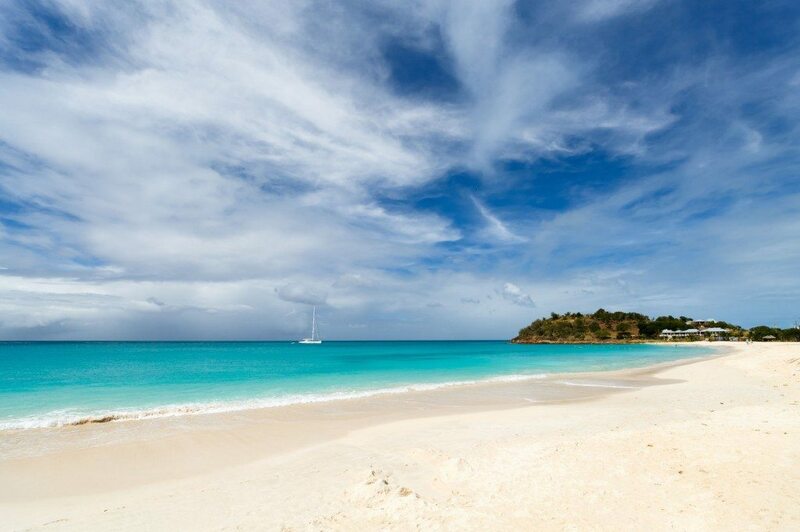 You won’t have to fight the crowds to find a square of sand to lay your beach towel either, as amazingly Antigua and Barbuda have between them 365 beaches! So it can be assumed there is enough beach to go around. I wish I could whittle down your options but picking a favourite is no mean feat, as is the quality of beaches here. 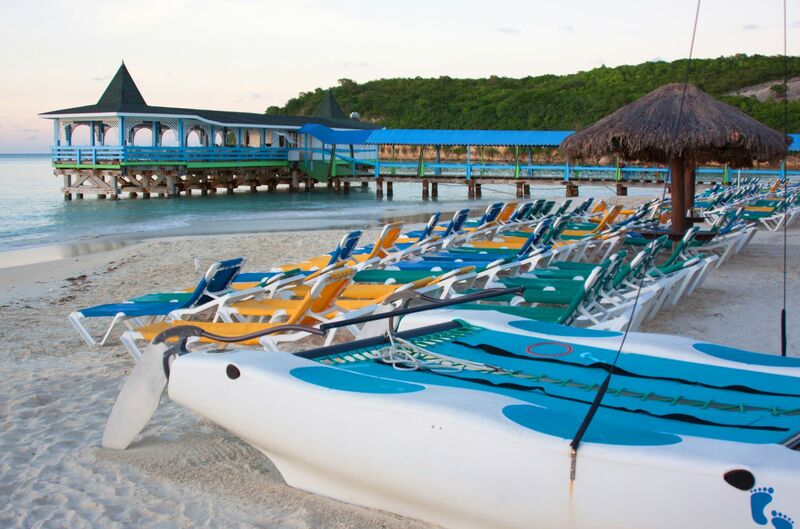 Should you be looking for beaches alive to the sound of splashing snorkel and flipper clad holiday-makers in the sea or rustic beach bars rocking to the sound of Caribbean music then Dickenson Bay, Pigeon Point Beach or Darkwood Beach represent an obvious choice. Quieter and secluded stretches of beach can be found south of Dickenson Bay in an area known as Runaway Beach, while the unspoilt Half Moon Bay offers isolated moments, due to lack of typical tourist amenities. While for those looking for unrivalled vistas look no further than Ffryes Beach; located on Ffryes point on the west coast of Antigua this beach features powder white sands with visible seascapes looking out towards Montserrat. Although numerous beaches can be found within a few minutes ride of popular resorts and populated areas, many are not and are more isolated. Many are accessible by public transport but unless you choose to arrive via taxi, renting a car is far less troublesome and enables visitors to move at their own pace. 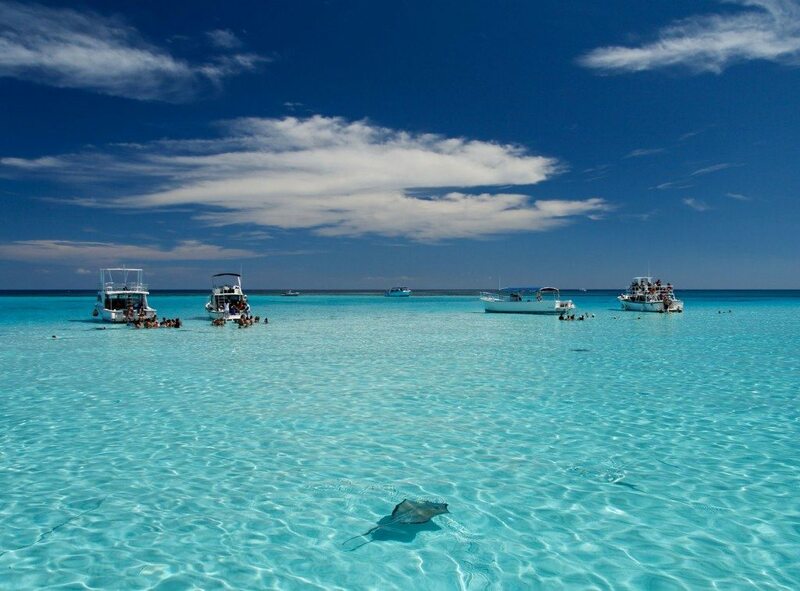 Located a 5 minute speedboat ride between Antigua’s offshore islands, concealed by coral reefs and sand banks is a shallow pool inhabited with the unlikeliest of sea creatures; stingrays. Do not be deterred by their almost Martian appearance as these creatures are little more than ‘puppy dogs of the seas’, as is their friendly, playful nature. Visitors are invited to paddle, pet and even feed these social creatures who crave interaction and attention from adult and child audiences alike. Afterwards, guess can snorkel amongst pristine coral reefs and the graceful tropical fish that inhabit the natural enclosure. Guests of the Stingray City Antigua experience start their trip enjoying the company of playful monkeys and parrots at the centre before being whisked off to the before mentioned stingray habitat. Afterwards, visitors are returned to the centre where they can rinse off before sampling complimentary rum or fruit punch in the dappled shade of the coconut trees, or purchasing mementos and photographs of the day. It is advised that Stingray City experiences are booked in advance and prices are available upon enquiry. Included in the price is lunch, drinks, hotel pickup and drop off, snorkelling tour, as well as knowledgeable tour guides. Typically, tours are held between 8 in the morning until 8:30 in the evening. Antigua, akin to its Caribbean island neighbours, enjoys an enviable tropical climate, one that is regulated by refreshing trade winds. The island generally experiences low humidity and prolonged dry seasons, with year-round temperatures rarely dipping below 23°c in the winter months and highs well into the 30’s in the summertime – good news for holidaymakers! 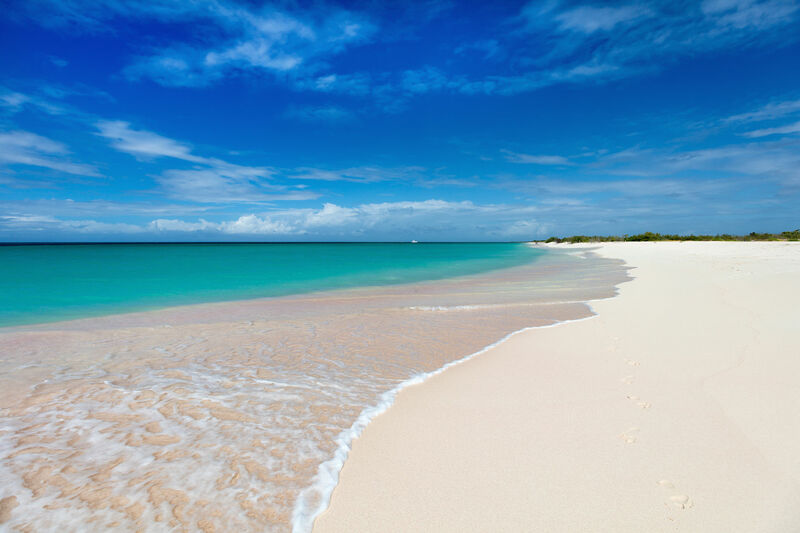 So whether you are looking for ceaseless tropical weather, glorious beaches or the laid back Caribbean atmosphere, Antigua is the choice destination for stylish beach lovers, sophisticated sun seekers and watersport aficionados. Although a year round destination, Antigua has an a calander of events rich with nautical challenges and cultural celebrations, visit our post to discover the Best Time to Visit Antigua. If after reading this you would like to make Antigua the destination for your next luxury holiday then simply give us a call on 0800 008 7288 and speak to our travel experts.